Updated from Ireland's Offi cial Mapping Agencies, OSI and OSNI, this atlas includes AA approved camping sites and AA recommended golf courses, car parks, picnic sites, port plans and ferry routes. 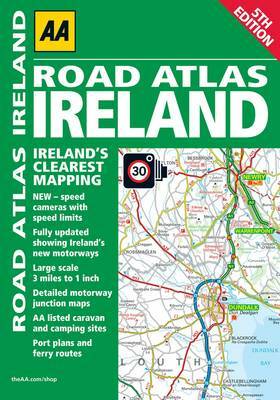 Plus, motorway strip maps detailing all of Ireland's motorway junctions. There are 11 detailed city and town plans: Belfast, Cork, Londonderry, Dublin,Galway, Killarney, Kilkenny, Limerick, Sligo and Waterford and an easy-to-read 3,500 place name index, including tourist sites.